Months ago, I had cut up the legs of the blue jeans in a continuous length about 1.5 inch wide. I had already used the pockets. Have I mentioned that I love recycling and using up the crap that I have! I finally felt like making something out of it. I started off making a bowl for myself. Ultimately, I feel that it is too big for its intended use. I have plenty of jeans to make more. When I made the bowl, the largest problem I had was that the denim that had stretch in it was difficult to control the tension on. I pulled a few times too hard and it pulled apart the factory seam. I had to go back and hand stitch these seams. I hope it will stay together. I hope that the receiver enjoys it . I really like the texture that the factory seams created. I think it would look much cleaner if I had made strips in to thinner tubes. I don't have the patience to turn them all right side out. Maybe with regular cotton fabric it would be easier. I am working on a super awesome easy tutorial for a pot holder that I made in masses to give as gifts this season. Check out this guy's insane images of snowflakes that he takes with his special camera! I found fwwidall on flicker. 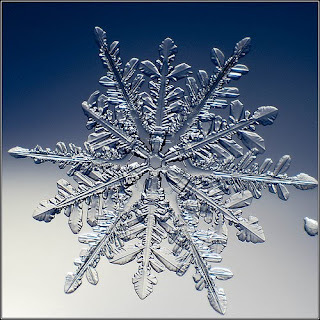 I was searching images of snowflakes that I can sew/quilt on some christmas gifts. I love this type of close up images of crystal structures. I look at one similar to this everyday, (hubby has water crystals tatted on his arm) It is amazing that he can capture the images. Nature is the most amazing artist ever!